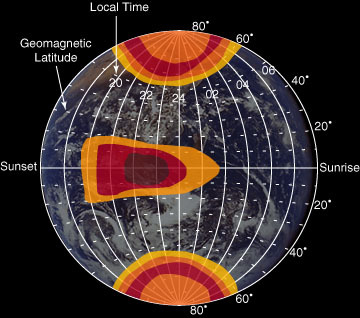 Are there Developing Trouble Spots in the Ionosphere Right Now? The ionosphere is made up of layers of electrons and ions that are suspended in the atmosphere at altitudes of 40 to 400 kilometers above the surface of the Earth. Short wave radio signals are reflected from the bottomside of these layers and return to Earth. However, high frequency radio signals punch through the ionospheric layers and can be received by satellites in orbit around the Earth. And likewise, radio signals from the satellites can be received at ground stations. In some ionospheric regions, however, these layers are filled with small-scale irregular density structures. The density structures cause radio signals propagating through them from a satellite to experience random fading in amplitude and changes in phase, called scintillations. The net result is that information can be lost or become extremely difficult to decipher. Where are the Major Trouble Spots for Scintillations? There are 3 major sectors of scintillation activity. These are the equatorial region and the north and south polar regions. Irregularities in the polar region are caused by precipitating high velocity auroral particles. The auroral particles violently collide with atmospheric particles, knocking electrons free, and creating enhanced densities. The fluxes of high-velocity precipitating particles are very structured in space and create irregular structures in the ionosphere. These same particles are responsible for the auroral lights. In addition, the flow of ionospheric plasma from the dayside to the nightside and vice-versa at high-latitudes results in the formation of large-scale plasma blobs and density troughs. The steep edges of these structures are unstable and soon generated intense regions of small-scale density irregularities that produce severe scintillation effects. These types of irregularities vary in severity and geographic location during space weather disturbances. In the equatorial regions, irregularities result from bubbles that form at the bottom of the F region ionization layer and percolate upward through the topside ionosphere, emerging just after sunset, distorting into plumes. The steep edges of the plumes are unstable and smaller-scale irregular density structures develop along these edges. The small-scale irregularities cause intense scintillation effects. Individual patches of irregularities have lifetimes of 2-3 hours. However, irregularities have been seen to continually disrupt this region for periods of up to 8 hours. These types of irregularities are not related to space weather disturbances but do increase with the solar activity cycle.